Before you get started with deploying System Center 2016, there are a few housekeeping items that you will need to take care of. First, be sure to review the hardware and software requirements to make sure that your system is capable of running Virtual Machine Manager 2016. Incidentally, one of the requirements for running a Virtual Machine Manager 2016 management server is that the operating system must be Windows Server 2016. In case you are wondering, it is possible to perform an in place upgrade of the Windows operating system. However, Setup displays a message warning you that an upgrade is not recommended. I have to confess that prior to writing this article, I wasn’t completely sure that an in place upgrade would work. After all, Virtual Machine Manager 2012 R2 was not designed to run on Windows Server 2016. Likewise, my Virtual Machine Manager server contains a local instance of SQL Server 2012. I was able to make the upgrade process work by uninstalling the Virtual Machine Manager components (except for the database), upgrading the operating system, and then upgrading Virtual Machine Manager. I will talk more about the Virtual Machine Manager upgrade process later on, but the important thing to know for right now is that the operating system upgrade did not seem to negatively impact my SQL Server instance. Before you begin the upgrade process, I strongly recommend backing up your Virtual Machine Manager server, your SQL Server, and your Active Directory. It is also worth noting that the procedures in this article are based on upgrading a standalone Virtual Machine Manager deployment. Clustered deployments are beyond the scope of this article. Once the operating system update is complete and you are ready to get started, mount the System Center 2016 Virtual Machine Manager ISO file, extract the installation files, and run Setup. 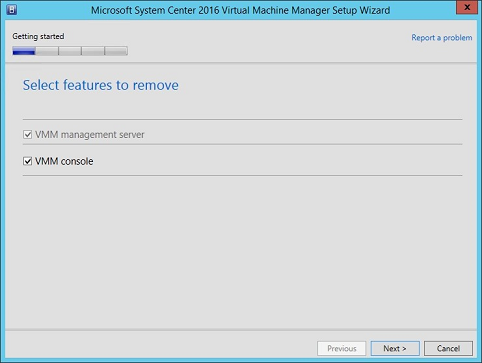 The Setup wizard does not allow you to upgrade Virtual Machine Manager 2012 R2 per se, but you can uninstall the previous version, and then install the new version, reusing the existing database. This effectively upgrades System Center Virtual Machine Manager, even though it is technically a clean install. 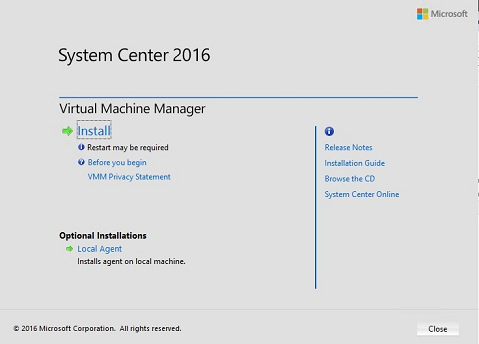 When Setup starts, you will see the System Center 2016 splash screen, shown in the figure below. Even though the previous version of System Center is still running on the server, go ahead and click Install. The installation process starts by clicking Install. After a short delay. 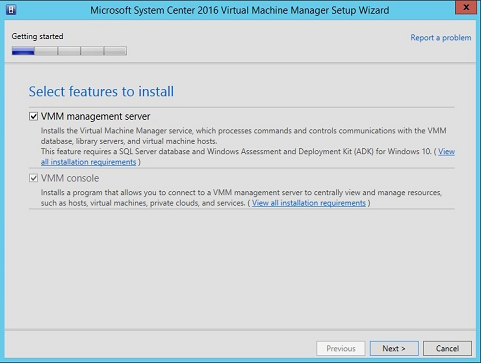 Setup will inform you that a previous version of System Center Virtual Machine Manager already exists. You will then be given the option of installing additional components or removing features that are currently installed. Choose the Remove Features option. When prompted, select any available component check boxes, as shown below, and click Next. Be sure to remove all of the features. The next screen that you will see is a really important one. This screen, which you can see below, asks you if you want to retain your database or remove the database. Since the goal is to upgrade an existing Virtual Machine Manager deployment, be sure to retain the database. Make sure to retain the VMM database. Click Next, and Setup will display a summary of the options that you have chosen. Take a look at the Summary screen to confirm that the database will be retained, and then click the Uninstall button. After the removal process completes, you will need to install the Windows Preinstallation Environment feature from the Windows Assessment and Deployment Kit for Windows Server 2016. You can download the kit at: https://developer.microsoft.com/en-us/windows/hardware/windows-assessment-deployment-kit Keep in mind that you do not need to install the kit in its entirety, you need only to install the Windows Preinstallation Environment. Once the Windows Assessment and Deployment Kit is installed, run Setup again, click the splash screen’s Install link, and then choose the Add Features option. Now, choose the features that you want to install, and click Next. Choose the features that you want to install and click Next. You will now be prompted to enter your name, your organization name, and your product key. After doing so, click Next. You will now be prompted to accept the license agreement Click Next on this screen, and on the Diagnostic and Usage Data screen. Now, verify the installation location, and click Next. You should now see a screen asking you if you want to use Microsoft Update to check for updates. Make your selection, and click Next. Assuming that Setup is able to verify that the prerequisites are in place, the next screen that you will see is the Database Configuration screen. You will need to attach Virtual Machine Manager to the SQL Server database that was used by the previous version of Virtual Machine Manager, as shown in the next figure. 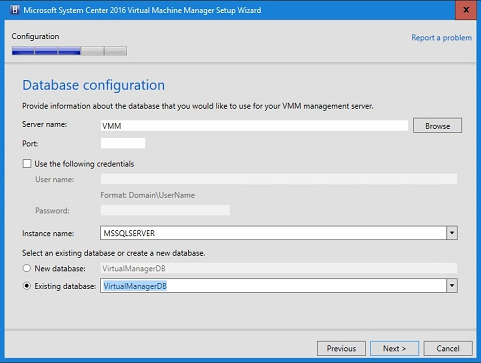 Connect Virtual Machine Manager to the existing SQL Server database. Upon clicking Next, you will see a message telling you that the database was created by an older version of Virtual Machine Manager. When prompted, click Yes to upgrade the database. The next screen that you will see asks you to specify the service account that you want to use. Ideally, you should use the same service account that you were previously using with Virtual Machine Manager. This screen also contains a prompt asking whether to store encryption keys in the Active Directory. Assuming your encryption keys were previously stored in the Active Directory, this option will automatically be configured for you. Click Next, and you will be taken to the Port Configuration screen. You should use the default port configuration unless you have a compelling reason to change a port number. Click Next and you will be taken to the Library Configuration screen. 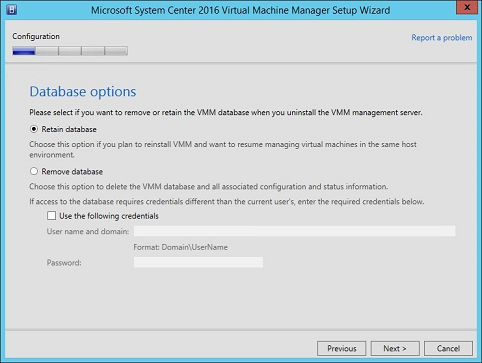 Because VMM is being configured to use an existing database, this screen will be automatically configured to use your previously existing library share. When you click Next, you will see an upgrade compatibility report. In most cases, this report will simply tell you that VMM doesn’t support the use of a library server that is running on Windows Server 2003. You may also see a message indicating that there may be additional tasks to complete once Virtual Machine Manager has been installed. You can see what this screen looks like in the figure below. This is a typical upgrade compatibility report. Click Next, and you will see an installation summary screen. Take a moment to make sure that the information displayed on this screen is correct, and then click Install. From this point, the installation process should complete. 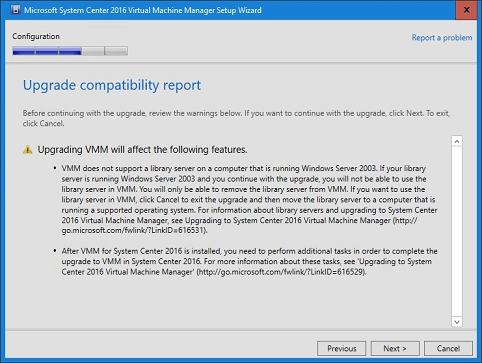 Upgrading to System Center Virtual Machine Manager 2016 is a relatively straightforward process. While writing this article, I did encounter one issue that I will mention in case it helps anyone. Initially, the VMM installation process failed, with an obscure error message (unfortunately, I didn’t write down the error message and can’t remember what it said). After a bit of troubleshooting, I found that the problem was being caused by clocks that were out of sync (which impacts Kerberos). The Windows Time service initially failed to start, but that was because the Netlogon service was not running. Once I started the Netlogon service and the Windows Time service, the issue resolved itself.